We’re not big fans of February. When it comes to your wardrobe, it’s something of a no man’s land. You know what we mean – it’s relentlessly chilly outside, but fashion is egging you on to perfect your spring (remember spring?) wardrobe. Because we fall firmly into the buy now, wear now camp – we’re far too impatient for the whole buy now, wear later lark – you’ll only find pieces that are truly wearable right now in our collection. Thick – and crease-proof – ponte gives our A-line skirt it’s structured shape, so a close-fitting top is a must to let it stand out. While spring still feels like a lifetime away, style your midi skirt with our fine-knit button side jumper for a look that’s cosy but still chic. The military-inspired combo of gold buttons and rich green is always on-trend too. Finish off with ankle boots or your favourite courts. 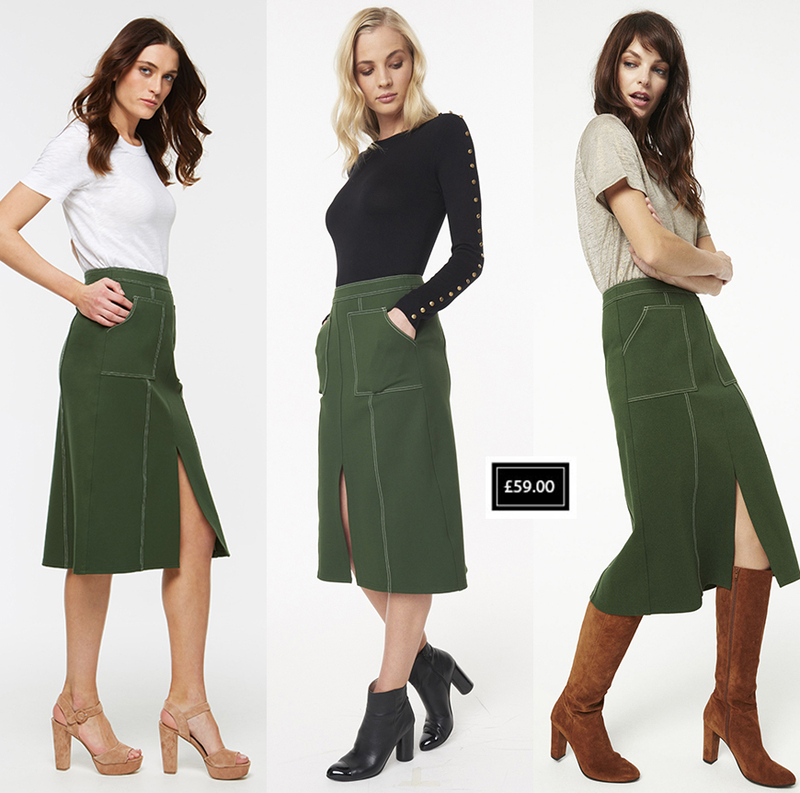 With patch pockets, top stitching and A-line shape, our midi skirt is perfect for channelling the ‘70s style love in that’s still going strong. To further up your retro outfit credentials, work your midi skirt with tan suede knee-high boots – it also happens to be a silhouette the street style set love. The ultimate finishing touch? A classic skinny rib polo neck. When the weather gets warmer, re-spin your skirt with the fashion pack’s favourite styling piece – the classic white tee. Go for a round neck, short sleeved style that’s not too clingy, and watch it make the top-stitching detail on our midi skirt really pop. Shoe-wise, try on-trend platforms or even your trusty plimsoll-style trainers for an off-duty spin.